There are a lot of green foods. Greens for one. Spinach, kale, chard. Then there are all the fruits and vegetables, from peas to pears, apples to mangoes, and of course Kermit the Frog. Green however is not something I'd normally associate with rice. I've had red rice from Bhutan, and black Forbidden rice, and brown rice and wild rice which technically isn't even really rice, but never, ever, green rice. I am always looking for new forms of rice to taste test and sample, so it was no surprise when offered a chance to experiment with some of Marx Foods Bamboo Rice, I'd jump at the chance. It's all part of their Easy Being Green blog challenge. We, the food writers, get a package of green foods and it's up to us to get creative with them. Marx Foods sent all of us Bamboo Rice, dill pollen, green eston lentils, mint crystals and green cardamom. Lots of good things can be whipped up with that combo. The rules were that we must use at least 2 of the products in whatever dish we made. Of all the ingredients, the one that really called out to me was the bamboo rice. Bamboo rice in case you've not heard of it (I hadn't) is a short grain sticky type rice which has been infused with the juice of bamboo. It has a lovely grassy green, almost minty aroma and a mild taste. Of all the things in the package I was sent, that was the one I most wanted to try. Second up was the mint crystals which I'd also never heard of before, but hey, that's why I go to Marx Foods. They've always got the latest, most interesting stuff. Mint crystals are fresh mint and pure cane sugar turned into crunchy nuggets. Since the blog challenge was to use any two products in the package and create a recipe, I knew which ones I was going to be using. I was determined to make something featuring the bamboo rice, mint crystals and green cardamom pods. After thinking long and hard, yesterday I had my answer. 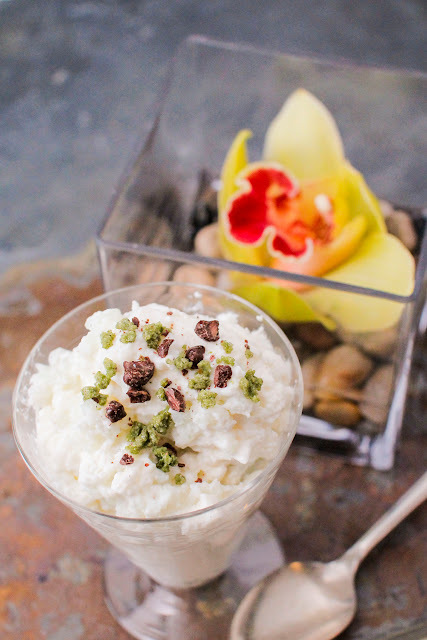 I'd make a rice mousse infused with green cardamom and flavored with mint crystals and cocoa nibs. Add 1 cup of bamboo rice to 2 and 1/2 cups of water. Bring the water and rice to a boil. Put a lid on the pot and turn down the heat to simmer for 20 minutes. When the rice is cooked, fluff io with a fork and set it aside to cool off. Put the whole cardamom pods into a mortar and pestle, and crack them. 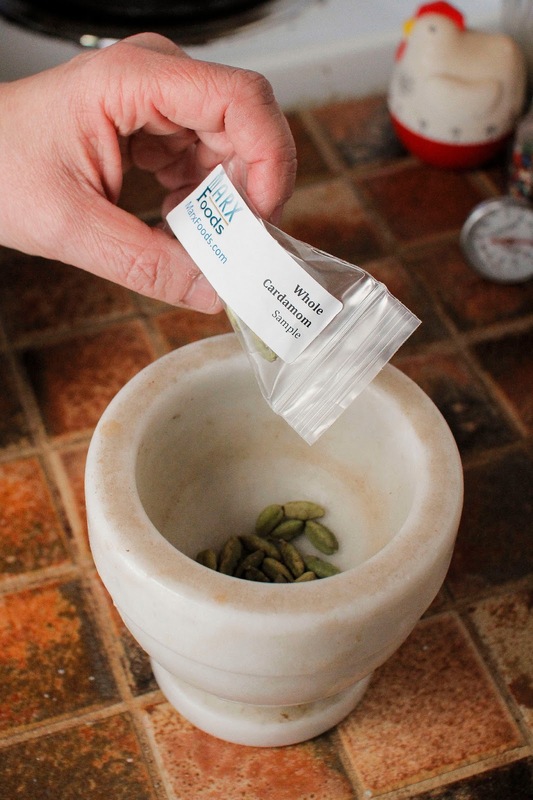 Take the seeds from the pods and grind the seeds down to a grainy powder. 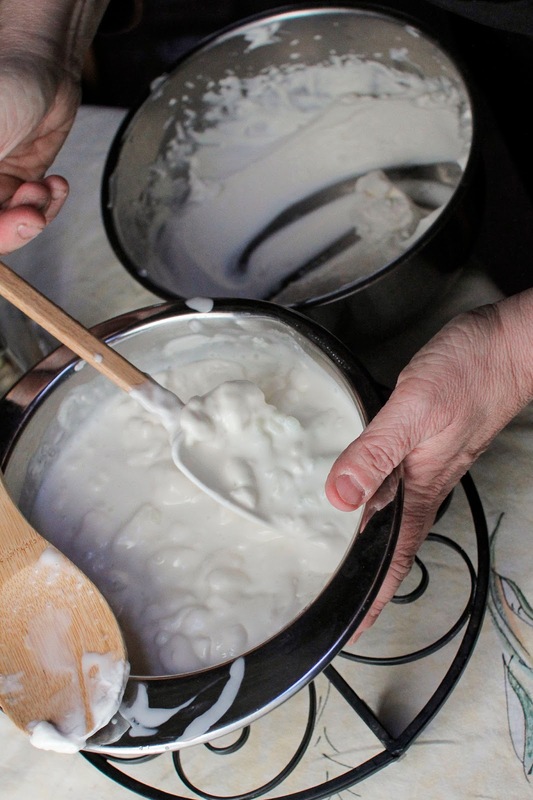 Combine the milk, sugar, cooked rice, and cardamom in a pot and bring everything to a boil. Meanwhile, dissolve the 2 Tbs of unflavored gelatine in 1/2 a cup of cold water to soften it. When the milk sugar, rice and cardamom are boiling, add in the gelatin mixture. Whisk it in well so as to not have any lumps. 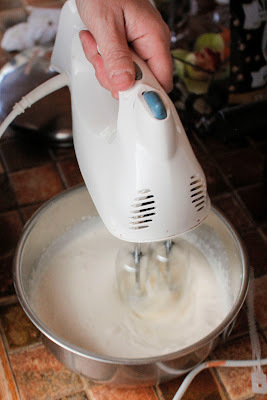 Meanwhile whip 1 cup of whipping cream with the vanilla extract. When the mixture starts to firm up a bit, gently fold in the whipped cream vanilla mixture. Set it in the fridge for a couple of hours to cool and set. Roughly chop the cocoa nibs and mint crystals. Scoop the mousse into individual serving dishes and sprinkle the tops with a mixture of mint crystals and cocoa nibs. Creamy delicious. It may look like it but it's not a rice pudding, it's fluffy like a mousse. Alan has not stopped talking about how much he loved it, so there's that. 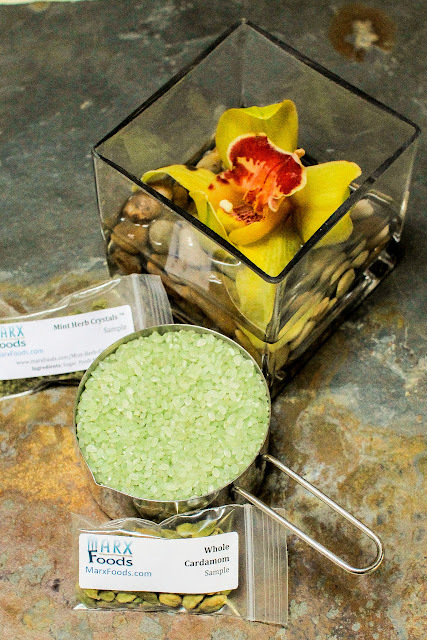 I loved working with the bamboo rice and mint crystals. Trying those new products has given me a lot of ideas for future use in savory dishes. Thanks Marx Foods. I always love the surprises you folks have up your ample food stuffed sleeves. The voting on this Easy Being Green Blog Challenge is on so hopefully you'll give this recipe a shout out by voting for it HERE. Coming up next fun food for Oscar parties. Follow along on Twitter @kathygori. Neat! Have always wanted to play around with bamboo rice moe. It's got a wonderful aroma, I highly recommend it! ooh, wish the rice had stayed green! 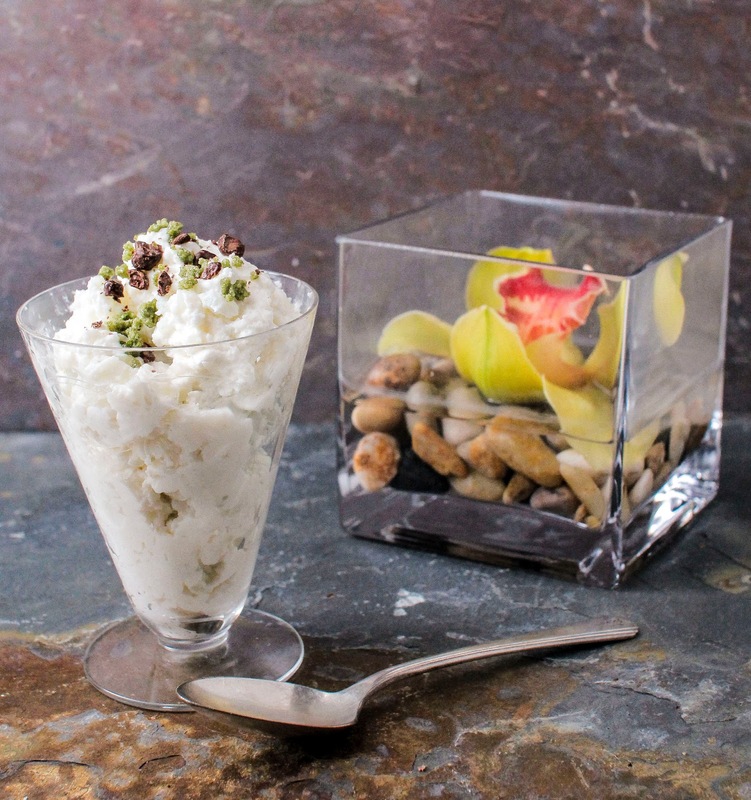 love this idea of turning rice pudding into a mousse :) and i had wondered if cardamom and mint went together--now i do! Nice! I like that you gave instructions for how to handle the cardamom pods. And whether it's rice pudding or mousse, I love both of them! Presentation of your article illustrated very well. This makes, recipe very simple to prepare. Thanks for sharing. Loved your blog!! And the pictures are so divine! Just became a follower! Thank you for sharing your gorgeous content. When you get a chance, do check out my blog Aalayam - its a blog about colors, cuisines and cultures. I am sure you will be interested.